According to Gearbox CEO Randy Pitchford, DLC is a gambling man's game. Gearbox Software is no stranger to downloadable content, with two DLC packs for the popular Borderlands already released and a third on the way. 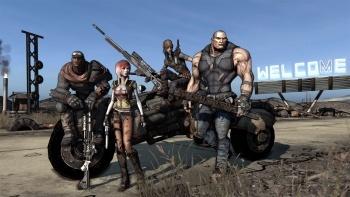 In an interview with GamesIndustry.biz, Gearbox CEO Randy Pitchford revealed that the company uses DLC as a testing ground for new gameplay styles. Pitchford first praises DLC for its convenience and relatively low cost: "The DLC option is about a convenient way to offer value to gamers that want it, and it's neat for gamers because if I love something, I'm excited when DLC happens. I can click a button, and a few minutes later it's there - I didn't have to drive to the store, it's not very expensive." He goes on to say how DLC is actually relaxing to developers compared to a full product: "You also know that if we sell 400,000 units of the DLC we're really happy, as opposed to if we don't sell 2 million units of this game we're not going to make our money back, so the economics of the relationship between the creator and the customer change." Pitchford continues: "So it's nice for gamers, but it's great for developers too - it's something we can explore, and take risks with. There are things we've done in our DLCs that aren't the kinds of things we'd risk in the core game - because you know you're offering it to the audience that's the most dedicated and loyal." Does this mean that DLC might not be evil after all? Could it actually be good for both developers and consumers? I'm with Randy on Gearbox's DLC philosophy, but I'm not sure it kicked in until the second Borderlands content pack. The first just kind of added an island full of zombies, and guns, but Mad Moxxi's Underdome Riot is almost a new gameplay mode. The Secret Armory of General Knoxx, Gearbox's next expansion for Borderlands, could be the biggest up to this point, and will add giant mechs. I haven't bought Borderlands yet because I feel a gold edition which will include all of this stuff for a bargain price is inevitable. It's going to happen, right Gearbox?